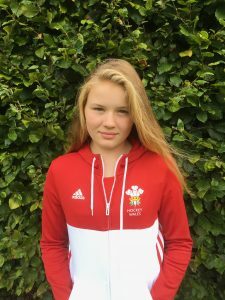 Annie (15) has been a member of the Welsh U16-18 NAGS squad since she was 13. She has already played in 2 Futures Cups and was the youngest keeper in the competition in her first year. This is the first year when she has been eligible for a full international cap. Annie is still the youngest keeper in the Welsh Squad. Also she is still one of the younger members of the squad. Every Easter Wales play a test series against Scotland and they take turns in hosting it. This year it’s in Cardiff and Annie has been selected to play in the U16 Squad. She will also hopefully have a chance to play in another test series over the summer against France which will be away. Wales will also take part in the U16 Euro 5’s tournament in Poland in July with 7 other Tier 2 Countries. I have attached a picture of Annie in her Welsh kit.